Thanks to Nick Spiller for lending me these marvellous items. Before the match the team meets in the usual hotel. The old brigade who clinched promotion for Brighton chat noisily, while the new boys – like John Gregory, bought in the summer from Villa – smile nervously on the edge of it all. Peter Ward sits alone and bleary-eyed. He has been up all night while his wife gave birth to their second daughter. There’s a studied air of calm about the Brighton squad, but the prospect of making their First Division debuts has several of them inwardly buckling with nerves. This, and the fact that FA Cup holders Arsenal are the visitors, has given everyone the flutters. All the Gunners’ players are familiar to the Brighton lads. Arsenal receive enough press exposure and TV coverage for a team-talk to be almost unnecessary. Alan Mullery concentrates on morale. Before they board the coach that will take them to the Goldstone Ground, Mullery tries one last piece of basic psychology. ‘Now listen. 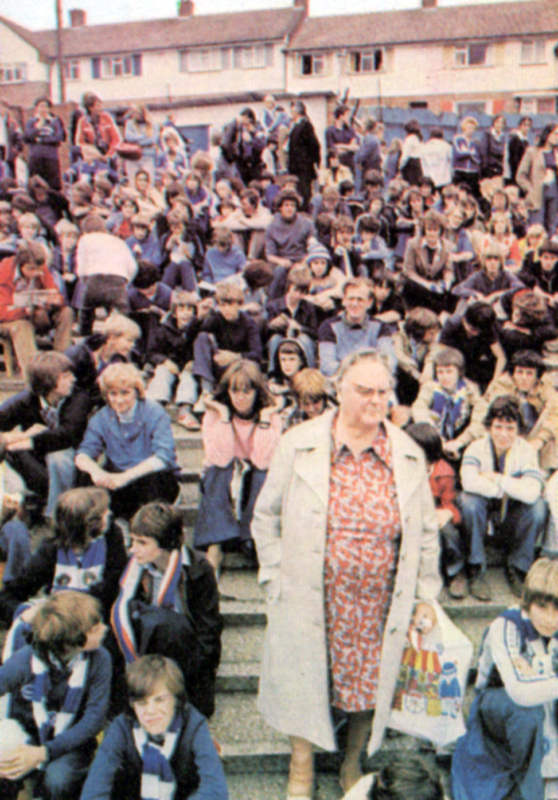 We know them, but I’ve just been talking to their physio, Fred Street, and they haven’t a clue what to expect from us. As the coach nears the ground, the jitters begin to surface again. Maybank senses the mood and tries to defuse it with a joke. ‘Don’t panic, don’t panic,’ comes his Corporal Jones impersonation from the back of the bus. Inside the ground, the atmosphere is electric: a pipe and drum band march past the brand new stand, and then the Albion players emerge in their ‘civvies’ to walk around the pitch and acknowledge the fans’ tumultuous applause. 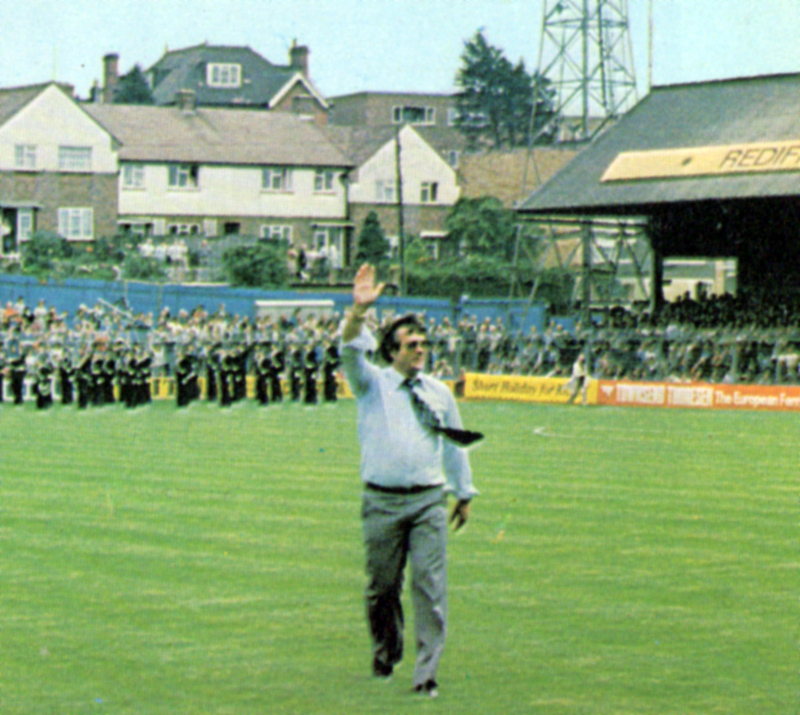 Striking up the band… Alan Mullery salutes the Goldstone crowd before the match. Despite their vociferous support, Albion failed to deliver any points on their big day. Ten minutes later they re-emerge. 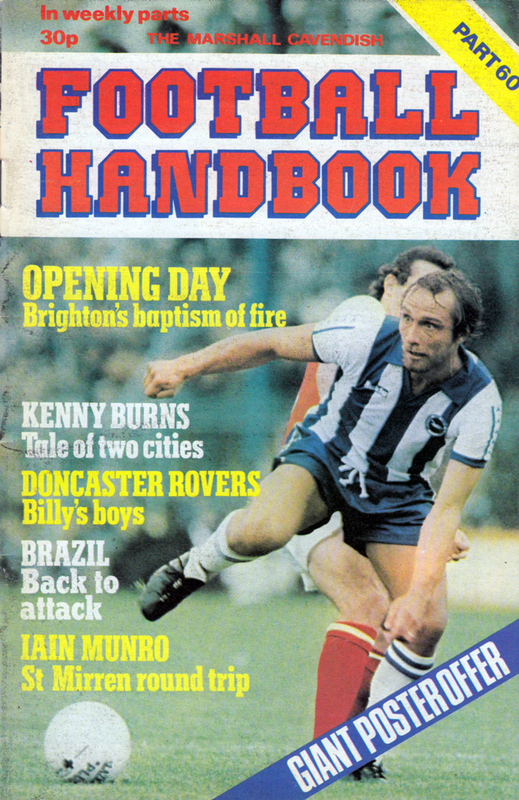 This time it’s for real – and within minutes Brighton’s First Division career has begun. 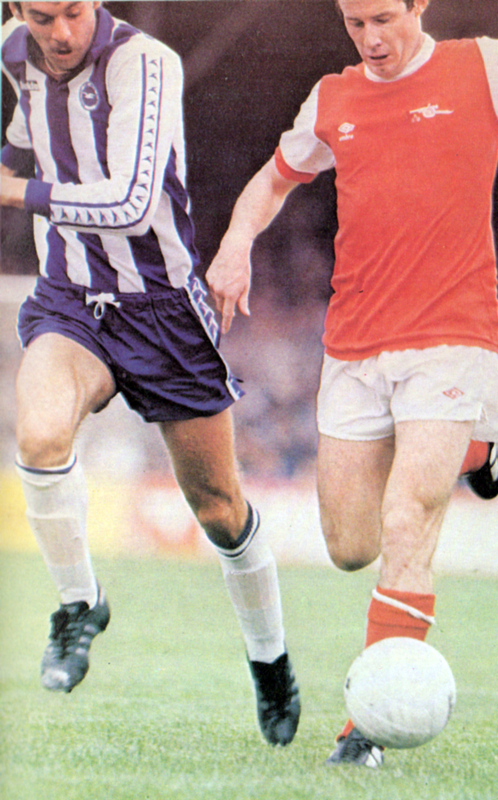 After 60 seconds Talbot and Horton tangle and the free-kick to Albion bobbles tantalisingly around the Arsenal box. Ryan latches on to it, wriggles through and swivels to send in a left-footer which the shovel-sized hands of Jennings tip away at full stretch. Three minutes later it’s Ryan again. 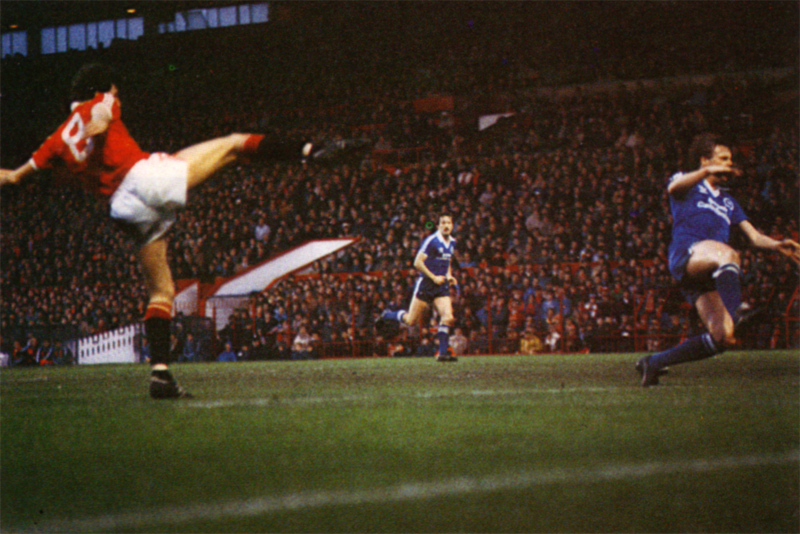 This time the toe-end of Willie Young’s despairing lunge relieves the pressure. The Brighton crowd scream their support. Although Ryan yet again comes close, Arsenal are starting to settle. Their offside trap is beginning to frustrate Mullery’s men and, ominously, the Rix-Brady shuttle service is starting to roll down the left. Then, inside the space often bewildering minutes, Brighton’s dreams come crashing down around them. 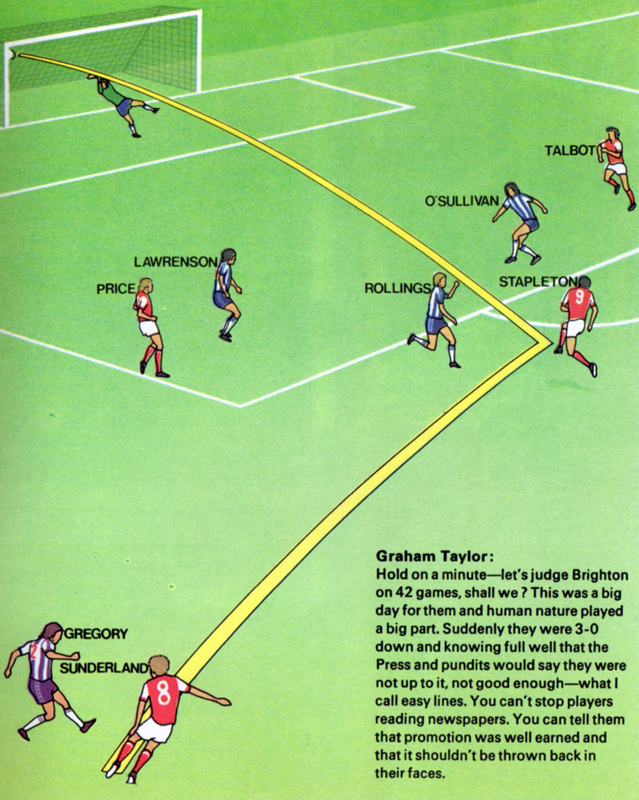 First Stapleton receives from Sunderland to crash a 20-yarder past Eric Steele; before Brighton have time to reflect on the seeming injustice of it all, Arsenal make it two – from Brady’s freekick, Young’s header drops to Sunderland, who nods in from a yard out. 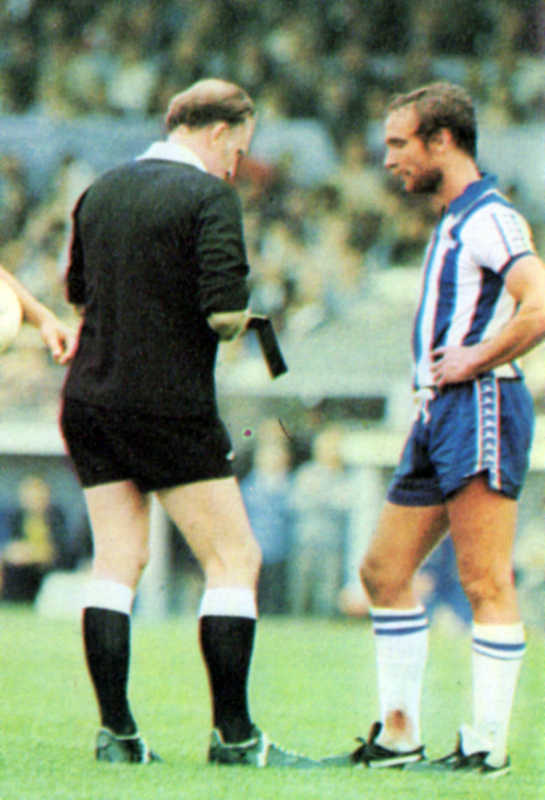 Albion skipper Brian Horton goes into the book after a clash with Talbot, who was also involved in several incidents. 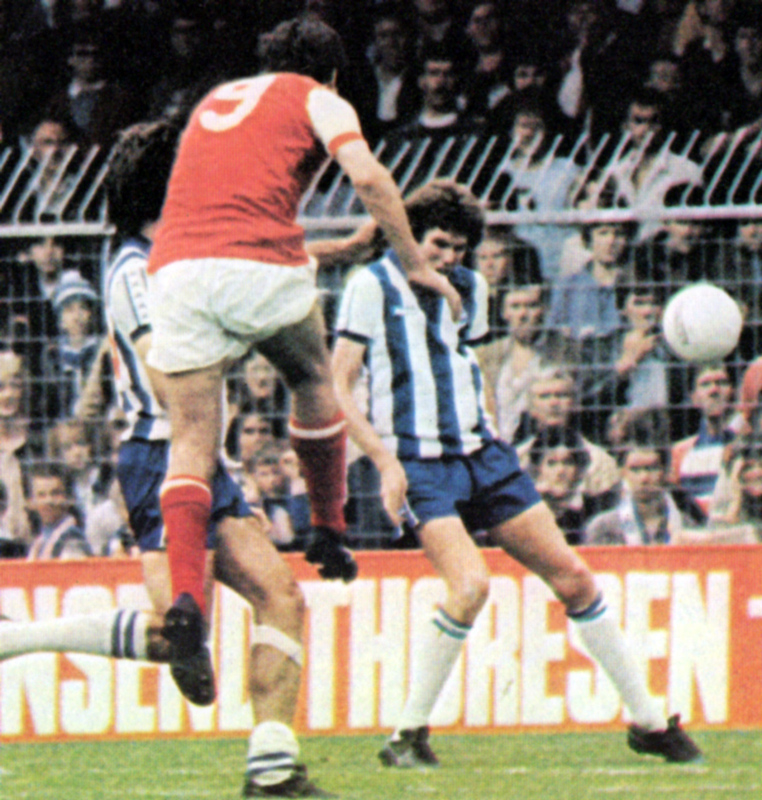 Mark Lawrdnson has just fouled Liam Brady… and nervous Brighton form the inevitable wall. By half-time Brighton are dead. Rix lofts a pass through the middle. Sunderland delays his run and then sprints past Rollings and scoops the ball over Steele. The keeper gets a palm to it but the ball still drops into the net; 0-3. But it’s all gone flat. Only the jigging of the Arsenal contingent breaks the silence as they mimic the ‘Sea-gulls’ chant with one of ‘Three goals, three goals’. And then a Brady penalty makes it four in the second half to really rub Brighton’s noses in it. Though bitterly disappointed, Mullery still finds time to praise Arsenal and pinpoint the difference between the sides. ‘They taught us a lesson in cold, clinical finishing,’ he says. The most meaningful lessons are usually the most painful to learn – in life, in football. 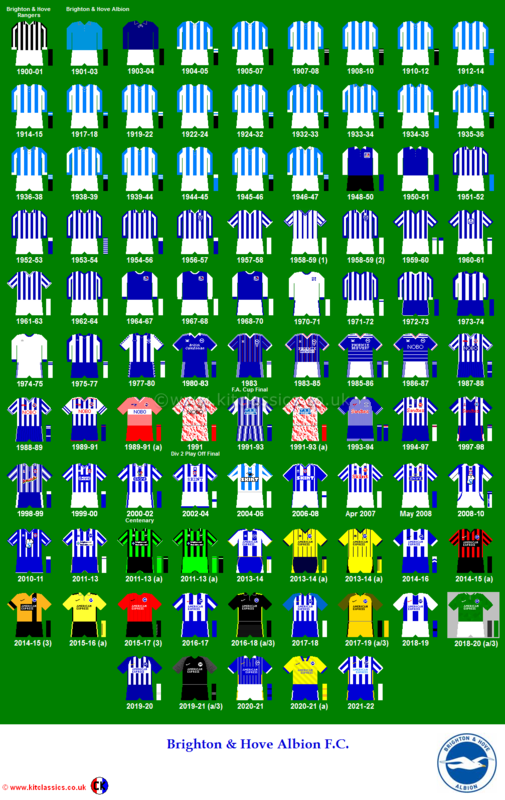 For Brighton and Hove Albion the moment of truth came on the opening day of the season, their first-ever First Division contest. FA Cup winners Arsenal were the visitors.., and the teachers. All the exuberance that took Brighton to promotion hardly dented the composure of silky Arsenal, to whom First Division pressure was nothing new. Manager Mullery’s ‘treat it like a cup tie’ approach – ‘we’re going to chase, fight and tackle’ – lost all significance once Arsenal took the lead approaching half-time. Brighton had had most of the play and, like an underdog boxer, must have fancied their chances of an upset. And, like many a ‘softener’ for the knock-out blows to follow, the goal that put them firmly in their place had an almost dream-like essence to it. 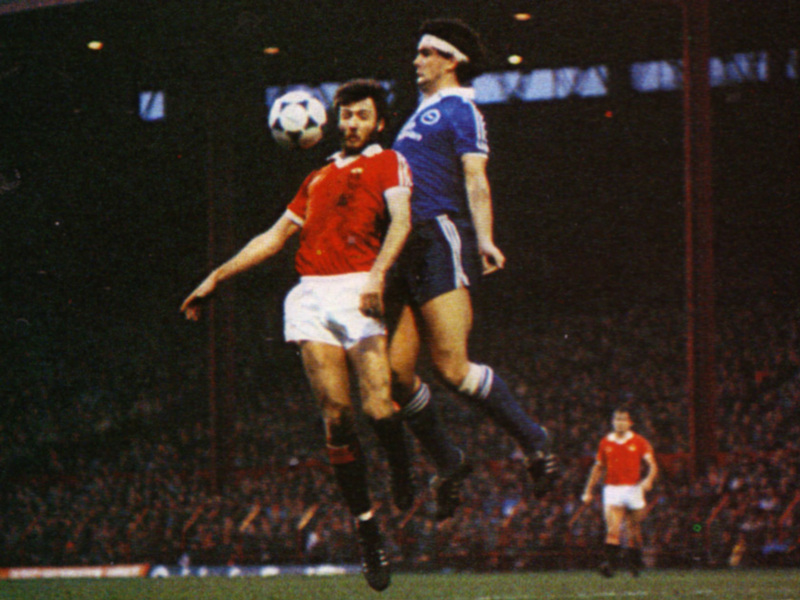 Inertia ruled among the Brighton players as Sammy Nelson played the ball down the left to Alan Sunderland. He was given space to cross where he liked and almost certainly aimed deep for Brian Talbot, who had made a typical run behind the home defence. His mishit went straight to Stapleton instead. Stapleton stumbled. The crowd laughed. Stapleton recovered but his shot from 20 yards was hardly a hammer blow. 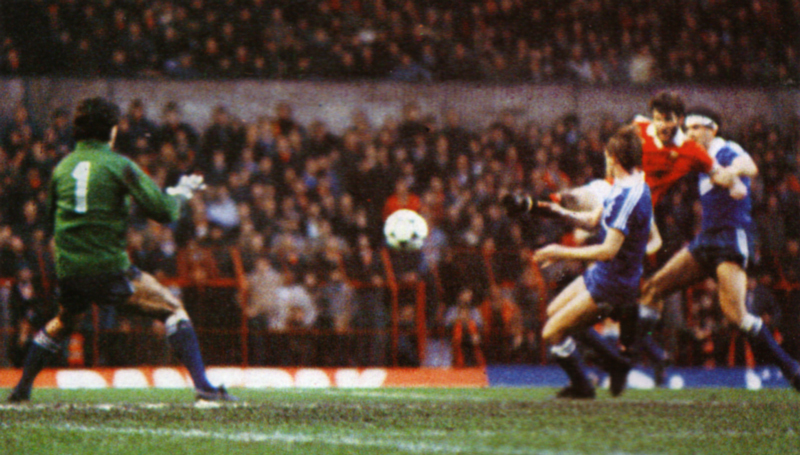 Nevertheless, it went in, the ball looping over the despairing Eric Steele. If that was a dream-like moment, it soon became a nightmare as Arsenal added two more quick goals before half-time. In the end it was a humiliating 0-4 scoreline, a result that Mullery rightly saw as a lesson in cold, clinical finishing. Knowing as we do Taylor’s close affinity with Derby County, presumably there can be no higher praise… but it is a massive tribute for one so young to have heaped upon his head. I seriously doubt whether such fulsome billing is good for young players. Of course, Ward is a very promising player. Why, then, did he not make a League debut earlier than eight games ago? In that time he has scored six goals, and opportunism of the sort displayed in the last month was missing in an attack that had gone off the boil. Naturally, Taylor is keen to enthuse about something after Albion’s failure to win promotion, and Ward is an obvious choice. He seems too level a lad to be affected by the cliches. Right now Ward has only one thing on his mind, and that has nothing to do with football. He and his wife Sue expect the arrival of their first child on Cup Final day. Some players have been known to be affected by offspring on the way. 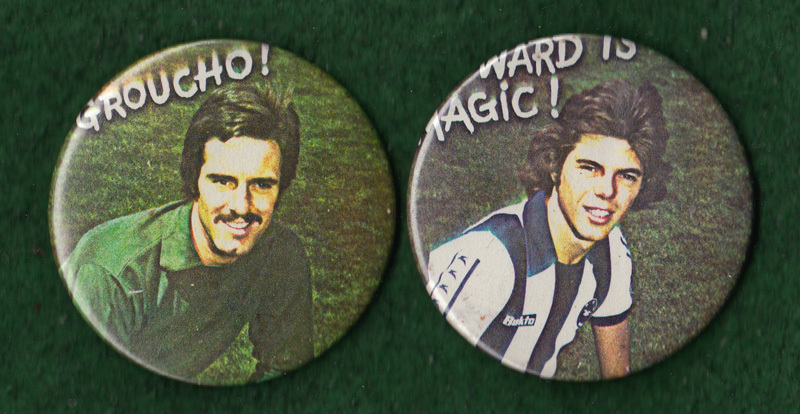 But not Ward whose rattlesnake speed of strike is an asset on which Albion must build next season. Incredible, isn’t it, that he has been an active participant in League football just one crowded, hectic month? In that time he has shown touches to send the pulses of most managers racing. His goal against relegation-threatened Wednesday came at a time when Albion looked booked for a first home defeat since September 10. Nobody would have been surprised had Wednesday broken their duck. Now the 1-1 draw means Wednesday must beat Southend at Hillsborough in the final match this week or crash into the Fourth Division for the first time. The anxiety until then can all be put down to Ward. Remarkably little is known about him because there is a basic shyness and modesty in his make-up. Interviews are foreign to him. This is as it should be – all the best players play with feet and head, not tongues. On the pitch, however, he has the right stamp of arrogance and determination, and an ability to turn defenders very quickly. His shot is spectacular because he doesn’t wait to tee the ball up. Lichfield-born, he played for a local side but was never associated with Derby County. He went straight from playing with his mates to Burton Albion, the Southern League club, and last season scored lots of goals, He cannot remember how many. Word soon reached Taylor, a former Burton manager, about Ward. 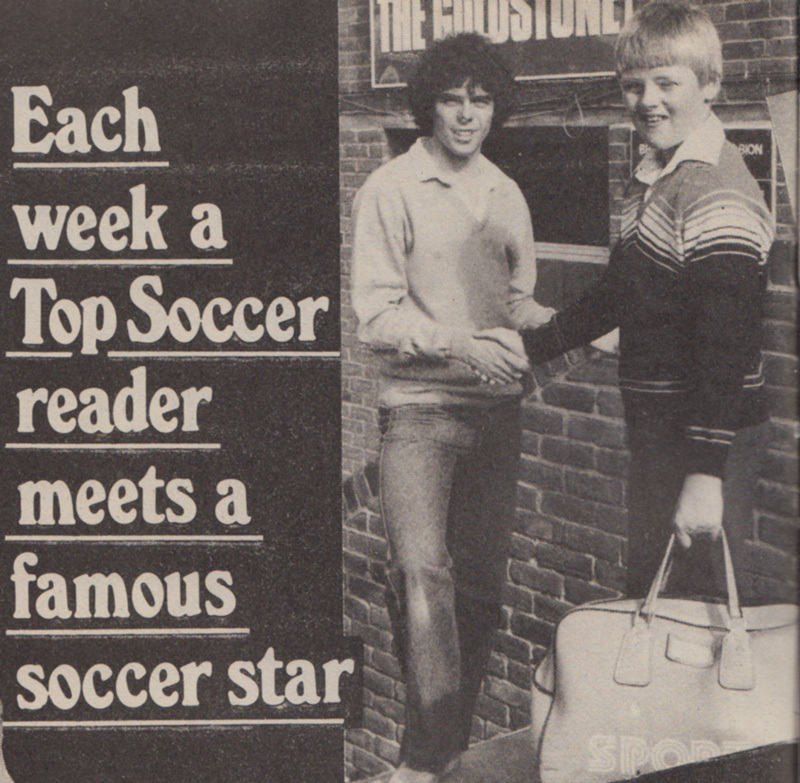 He was in with a cheque before any rivals, and £4,000 brought Ward to the Goldstone last summer. He was duly dispatched to learn his trade in the reserves. Tuesday night regulars at the Goldstone soon noted his prowess. When Ward debuted at Hereford, it was not before time. His name went on the scoresheet in just 50 seconds. He had arrived. 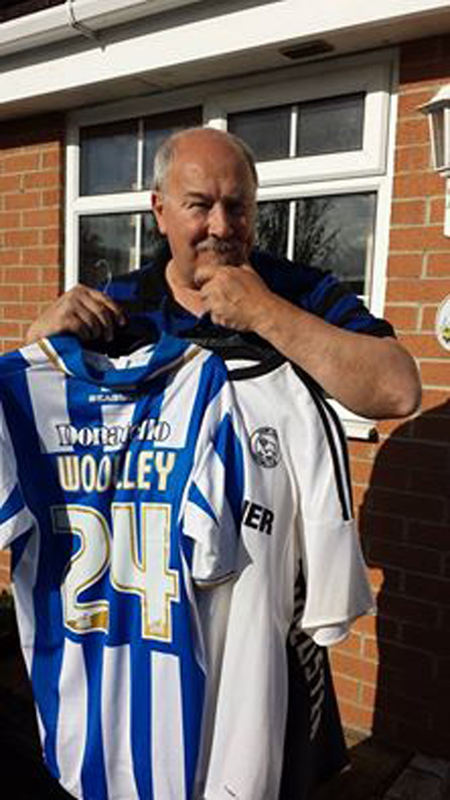 The next match was at Rotherham and he gave Albion an early lead there. At Chesterfield it was a foul on Ward that led to a Joe Kinnear penalty. By this time the lad was starting to feed off Sammy Morgan. They were looking a good pair together. But at Chesterfield, Morgan was injured. In the Port Vale game Ward’s name appeared in the score frame. Nothing doing at Millwall, but he nearly broke the net with his equaliser at Aldershot. A lot of running and effort finally paid off against Gillingham with a flashing header. 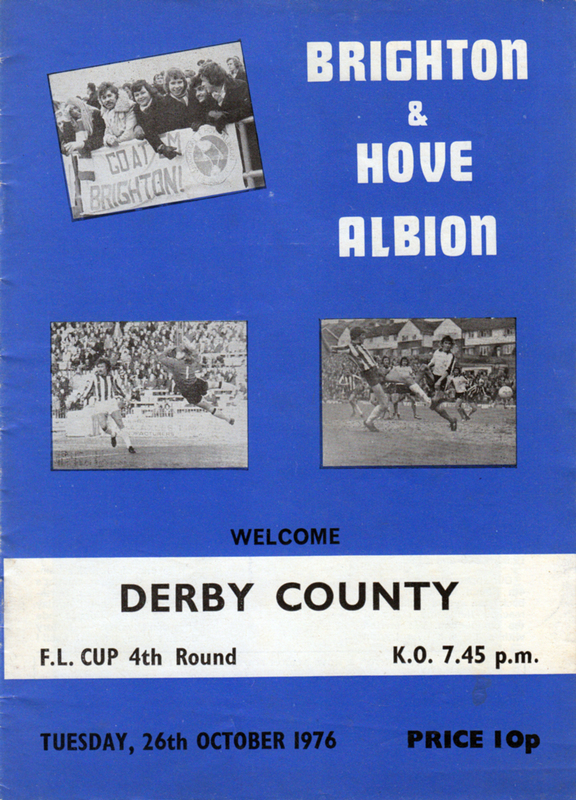 And so to the final game when his flair meant Albion finishing with 39 points from their home matches. Dropping only seven was a remarkable feat, and should have taken them into the Second Division. 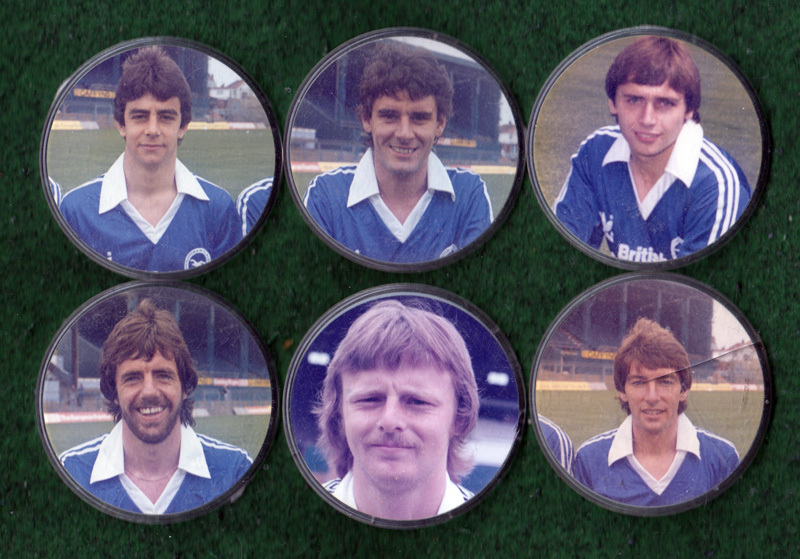 The millstone that kept Albion down was the dreadful away record. The Ward goal apart, and yet another strong display by Brian Horton, and solid performances we have come to expect from Andy Rollings and Steve Piper, the less said about Albion’s performance, the better. Apart from Ward’s equaliser, the most appreciated touch came before the ball was kicked. Skipper Horton led the players round the ground and they applauded the crowd for their support. The spectators acknowledged the gesture warmly and two minutes later stifled groans as Eric Potts scored the softest goal at the Goldstone for many a long year. While the 11,859 crowd was the lowest since September 27, it was by far an ways the best in the division. Hereford, who have run away with the championship, had only 8,950 as the trophy was handed over. Two minutes: There seemed to be no danger when POTTS swerved away from Horton’s biting tackle. A low shot from just outside the box looked covered by Grummitt, but he could only get a hand to it, and the ball trickled over the line. 0-1. Eighty-nine minutes: A long ball from the back was nodded down by Mellor, and WARD slammed it on the volley. 1-1. At the time, it was the shortest England career. Current holder of this record is Martin Kelly (Liverpool) with two minutes in May 2012. 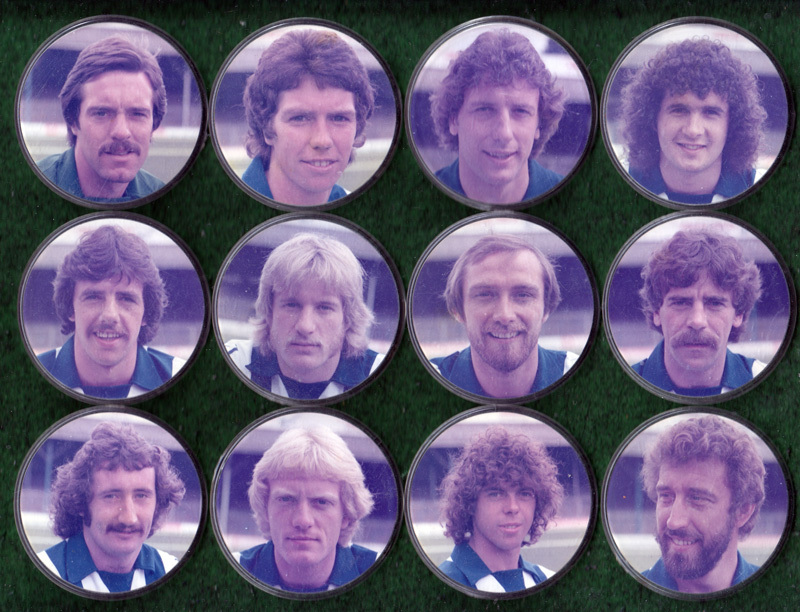 In 1979, Brighton & Hove Albion achieved their dream of reaching the top flight. Unsurprisingly, the Evening Argus marked the achievement with a 40 paged ‘Division One – Here We Come’ supplement. 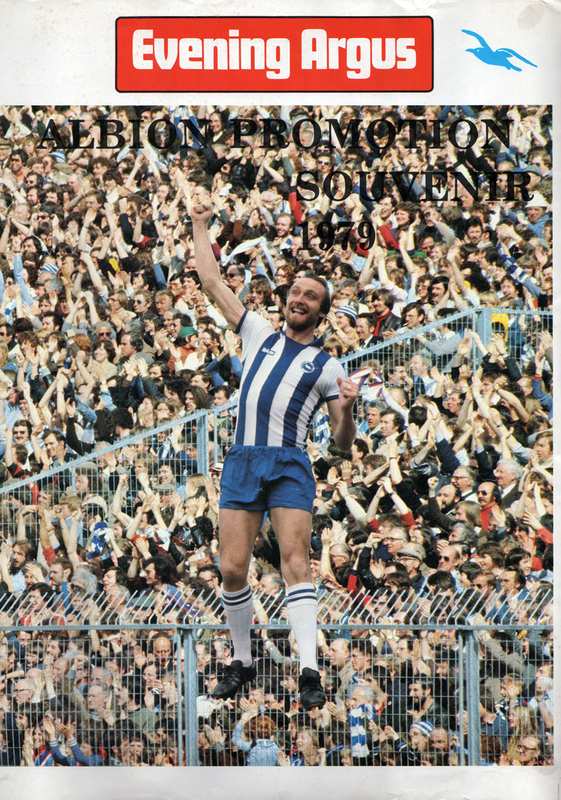 To obtain a free full-colour folder celebrating Albion’s promotion, fans can collect vouchers from six different days’ issues of the Evening Argus, starting on Monday. 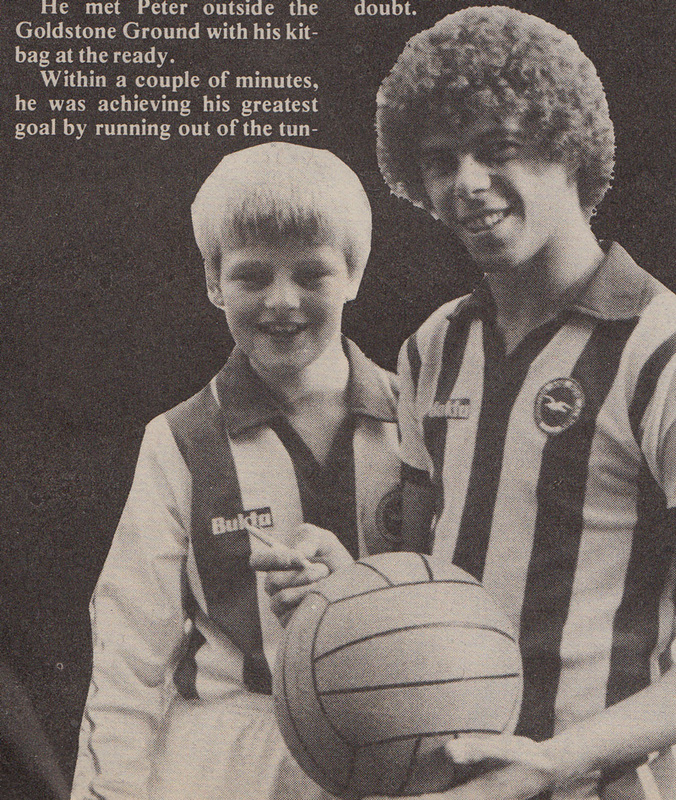 Each voucher carries the name of a different Albion player. 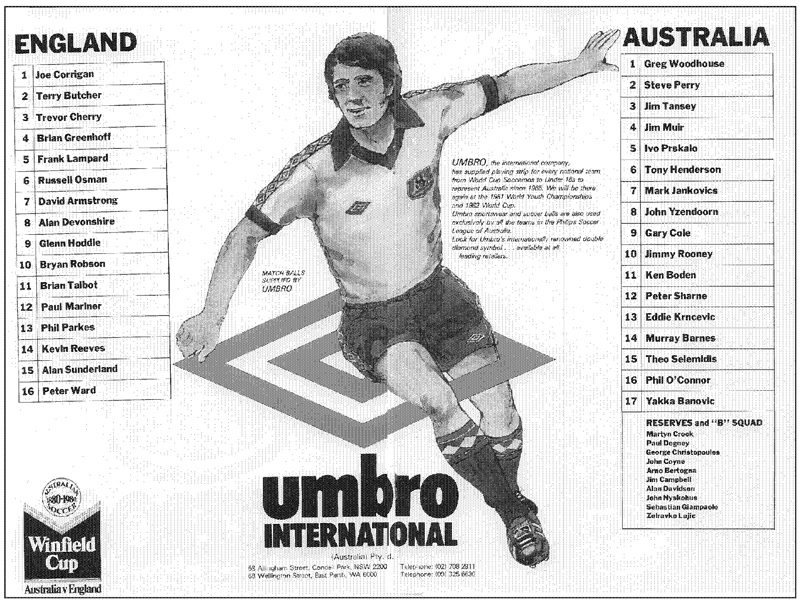 The folder, printed on art paper, includes a team picture in full colour. You can use it as a cover for this souvenir supplement or alternatively as a wall poster – or both if you collect two sets of vouchers. All you had to do was bring your vouchers to any Evening Argus office on or after Wednesday 23rd May or send it off to the Argus promotions department. 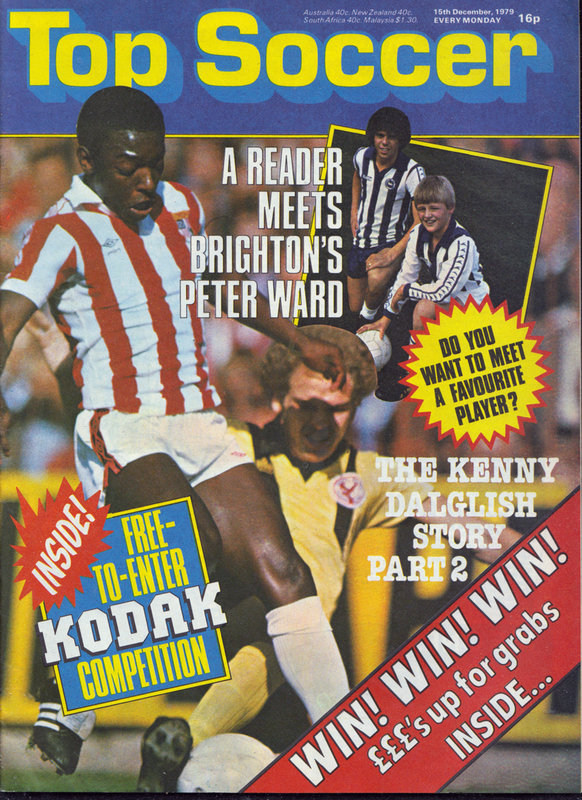 Whatever happened to Peter Ward? 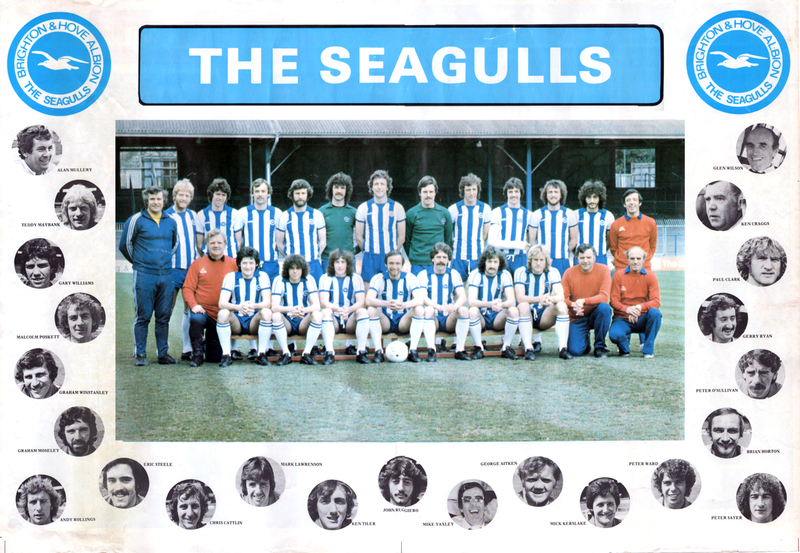 The name of Peter Ward still sets Seagulls fans chirping on the South coast. They remember the nonchalant way he waltzed around defenders and turned goalkeepers into quivering wrecks with his lethal finishing. But it’s the followers of America’s Cleveland Force who are being delighted by the skills of the former Brighton favourite. It’s more than three years since the Goldstone witnessed a Peter Ward goal ~ which has become so familiar in the Major Indoor Soccer League he now graces. The United States has become Peter’s adopted home since he quit English football and admits: “I’ve loved ever of it. But Peter does confess that, while he has never regretted making the move, there are times when he yearns for the English First Division. The American indoor season only runs from November to May, and he says: “We have the rest of the year off and the family and I spend it travelling around the States. “It’s such a long break from football, and now and again I do wish I was back playing in England. “In fact it would be great for me if the American season ran during the summer and I could return home to play in the winter. “But having said all that, being off during the summer does provide an opportunity to travel that we wouldn’t have had otherwise. 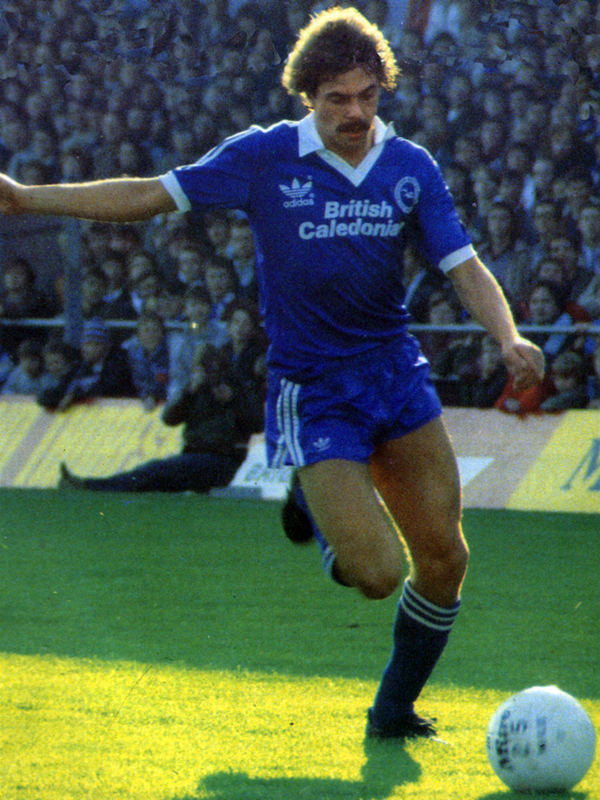 Peter had his first taste of Stateside soccer in the summer of ’82 and after one successful season with Seattle he was hooked. 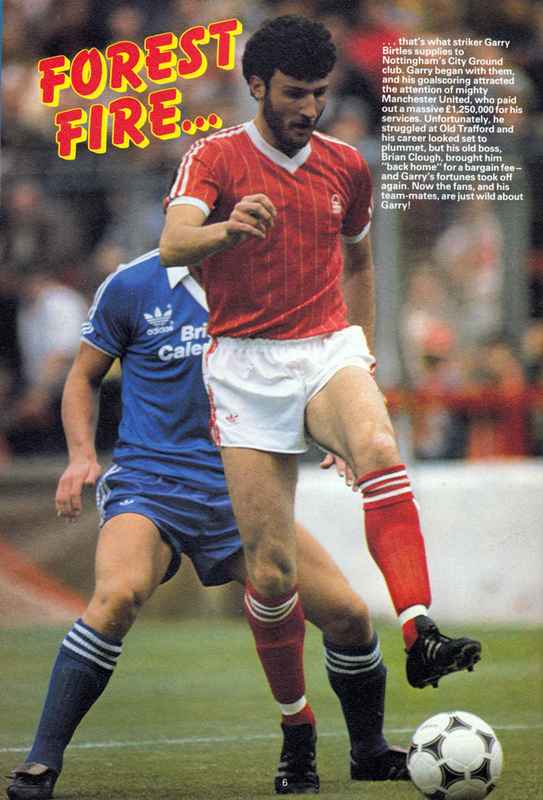 Following the disappointment of his spell with Nottingham Forest – a big-money move which had promised so much – his American adventure provided a heaven-sent opportunity to lift his flagging spirits. 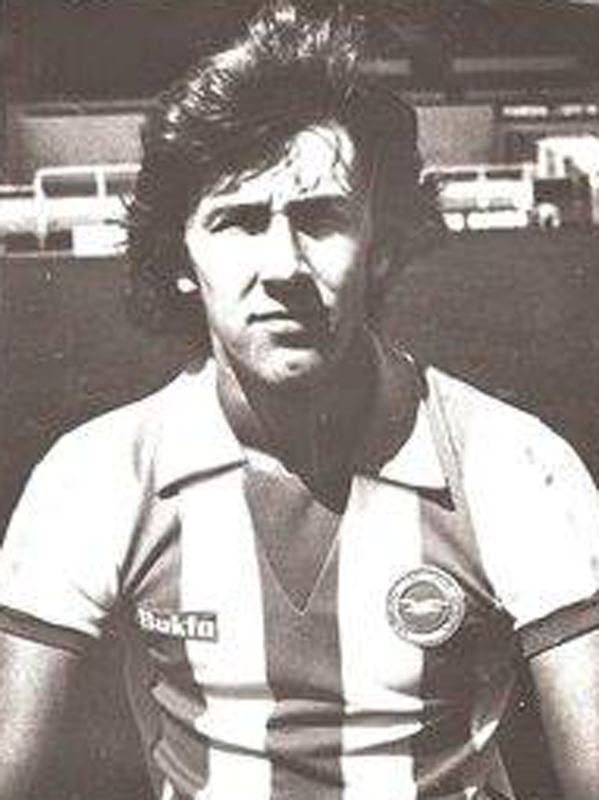 He was voted the NASL’s top player in his first season and although he returned to Brighton for a brief loan spell he was convinced his future lay overseas. “That first summer in Seattle was so enjoyable that I had to go back,” says peter. “I played for them again the following year and I’ve been in America ever since. “I also had a spell with Vancouver and since the NASL folded a couple of years ago I’ve been playing in the Major Indoor Soccer League with Cleveland. Instead of the normal 90 minutes MISL matches consist of four 15-minute quarters played at frenetic pace. “It’s very exciting for the fans and exhausting for the players,” he admits. “In fact it’s very rare for anyone to play more than half a match. “The usual thing is to have a couple of minutes on the field and a couple off to catch your breath. The teams are always being switched about so it’s non-stop stuff. “The atmosphere inside the magnificent stadiums we play is tremendous, especially when there are about 20,000 excited fans chanting and screaming. “I’ve really enjoyed playing indoor soccer but I think I’ll probably stay here for just one more season before moving on.